The Crew 2 is Ubisoft’s follow-up to its ambitious, but ultimately flawed open-world racing game from 2014, The Crew. Developed by French studio Ivory Studio – a team who created the Test Drive Unlimited franchise, The Crew was undeniably innovative and unique, and delivered a map that encompassed the entirety of the United States of America, including all the major cities, landmarks, and locations. Driving through every inch of its vast open-world would typically take hours as you embarked on its revenge-inspired storyline, which ultimately fell flat. Due to its ambition, The Crew also didn’t have the graphics you’d come to expect from an Xbox One and PS4 title, and its handling simply wasn’t there either in comparison to the likes of Forza Horizon. However, Ubisoft remained committed to The Crew. It delivered two post-launch expansions in Wild Run and Calling All Units, whilst radically improving both the gameplay and visuals to bring it up to par with the competition. It also added plenty of new vehicles and mission events via post-launch content updates, and even to this date, it still has an active player-base with more than 12 million players having enjoyed the game since its first release. Despite all these improvements, The Crew still has its fair share of bugs and issues, and the handling model needs a lot of work, but Ubisoft looks to change all that with The Crew 2. The Crew 2 recaptures the vastness and freedom of its predecessor, but greatly expands on it. First debuted at E3 2017 in Los Angeles last year, The Crew 2 made headlines with its innovative new features and overall direction – swapping its revenge-inspired narrative for a motorsport-themed festival. 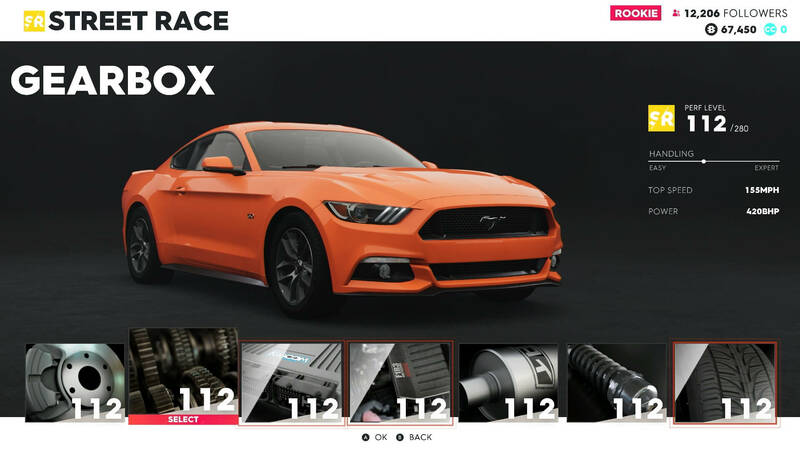 It also took fans by surprise by introducing boats and planes as two all-new vehicle types to enjoy, adding to the cars, bikes, trucks, and race machines already present in its roster. The Crew 2 has one of the largest, most diverse and unique vehicle line-ups I’ve ever seen in a racing game, and at a recent private press event at Mercedes-Benz World in Surrey, UK, I had hands-on with a near-complete version of The Crew 2, and it was extremely impressive. The Crew 2 is taking the racing genre in a new direction by making an open-world arcade racer that focuses on motorsports. This is typically reserved for simulation-focused titles like Forza Motorsport and Gran Turismo, but Ivory Tower are onto something with how its implementing its vision for motorsports in The Crew 2. It won’t be replacing the simulation racing genre anytime soon, but The Crew 2 does include modern race cars, as well as officially-licensed stunt planes and powerboats, and even tracks such as Mazda Raceway Laguna Seca and its own test circuits. Yep, this is indeed a Red Bull Formula 1 race car driving around a test track in The Crew 2. 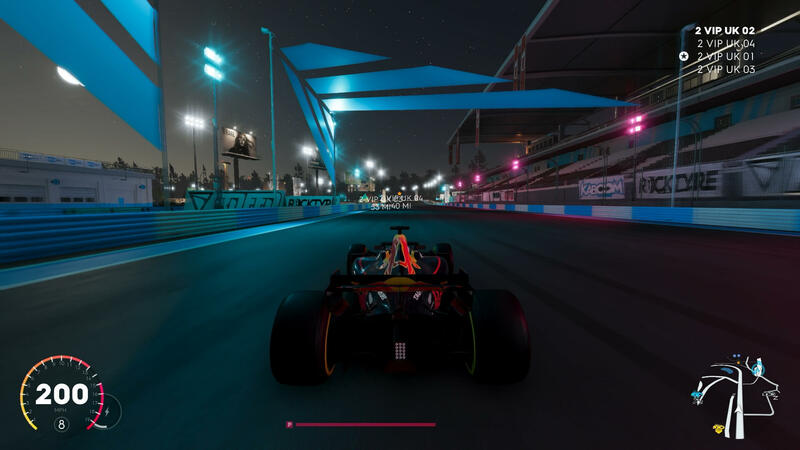 In fact, one of the moments that stands out to me most throughout my entire demo is when I had the opportunity to experience the thrill of the 2017 Red Bull RB13 Formula 1 race car around one of the game’s oval test circuits. It was a unique experience and something I didn’t expect to see in an open-world arcade racer. Likewise, The Crew 2 also has the 2018 Alpha Mark II – a futuristic prototype race car that whizzes around the track at insane speeds. Perhaps a modern GT3 race car is more your style, and The Crew 2 even has you covered there with the inclusion of the 2016 Mercedes-AMG C63 Touring Car, the 2017 Porsche 911 GT3 RSR, and even the Lamborghini Huracán LP 620-2 Super Trofeo competing in the Blancpain GT Series. Not all race cars feature the official team liveries and sponsor decals, but that’s okay, because there’s a large variety of these cars, and The Crew 2 isn’t a track racer at the end of the day. But if you want to cruise across America in GT3 race cars with your friends before later transitioning to the skies or sea in the respective aircraft or powerboat of your choice, then you can absolutely do that – and it’s that level of freedom that makes The Crew 2 so special and memorable. Race cars are present in The Crew 2, and in a big way. There's plenty of choice and variety. Race cars are some of the most fun and exhilarating vehicles to drive in any racing game, and their inclusion in The Crew 2 is a rather pleasant surprise. With a vastly improved handling model over its predecessor, it makes them enjoyable to race whilst also challenging to master. Getting to grips with these monsters on the tracks featured in The Crew 2 can be a real treat, and there’s a vast library of these race cars found in the game, including models from Alfa Romeo, Aston Martin, Bentley, BMW, Ferrari, Ford, Lamborghini, McLaren, Mercedes-AMG, Porsche, and Nissan. Some of these feature custom kits – like the Forza Editions found in Forza Motorsport 7, whilst others are pure-bred race cars taken straight from the track. Regardless of which you prefer, there’s plenty of variety – and like every other vehicle in The Crew 2, they all support nitrous. Race cars are only one part of the story when it comes to The Crew 2. I chose to focus on them first because they’re some of my favourite cars out there. Period. But that doesn’t mean I didn’t enjoy everything else The Crew 2 had to offer. Far From it. The inclusion of the hottest and latest supercars was another plus point for me, as well as the aircraft and boat mechanics – all of which handle surprisingly well. Then there’s the huge map, which has been redesigned and improved to make it an immediately-noticeable upgrade over its predecessor. The Crew 2 takes motorsports to all-new heights with its ambitious and unique gameplay. The Crew 2 is undeniably full of content, but to unlock it all, you’ll need to cash, and naturally, you’ll want to experience all the different motorsport disciplines found in the game. This is where the all-new motorsports-inspired campaign comes into play. The Crew had a gritty, depressed narrative that saw you as a rookie street racer on the hunt for revenge. In The Crew 2, you’re an aspiring motorsport athlete hoping to make a name for yourself across each of the game’s disciplines in MotorNation. Be it street racing, circuit racing, drifting, stunt plane events, boating, or so on, there’s a large array of events for you to compete and dominate in – should you have the skills and vehicles necessary to do so. When you load up The Crew 2 for the first time, you’ll be prompted to choose from a selection of premade characters to represent yourself in-game. Whichever one you opt for will become your rising star of fame as you work towards mastering all the different motorsport disciplines found in the game. Once selected, you’ll be quickly introduced to the ambitious world of The Crew 2 and everything that lies within it. Your path to becoming a motorsports legend begins here. Before you hit the open road, you'll need to select a character to be your rising star to fame. The motorsport-inspired campaign mode also embraces the new age of social media. 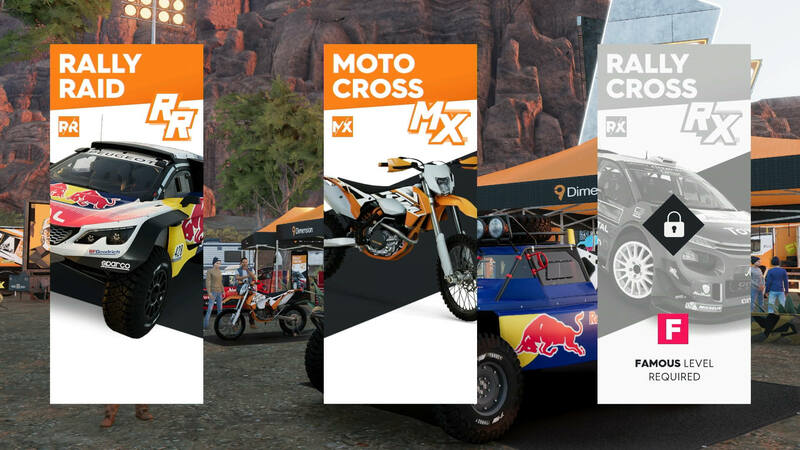 This is showcased by your in-game follower and popularity count, as well as the ‘Live Xtreme Series’ – the company broadcasting and sponsoring each of the events found in The Crew 2, which in turn leads to you being discovered by fans and an overall increase to your followers. You can tell there was definitely some inspiration taken from Forza Horizon 3’s festivals and fans systems for this, but that isn’t a bad thing at all as it works quite well. 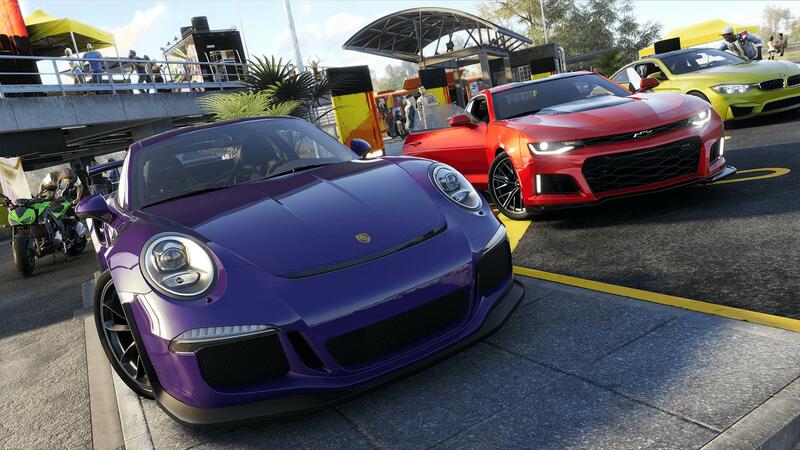 Your first driving experience in The Crew 2 will be in one of the game’s hotly-anticipated new vehicles – the 2016 Porsche 911 GT3 RS, as you race your way through a wet-surfaced New York City. 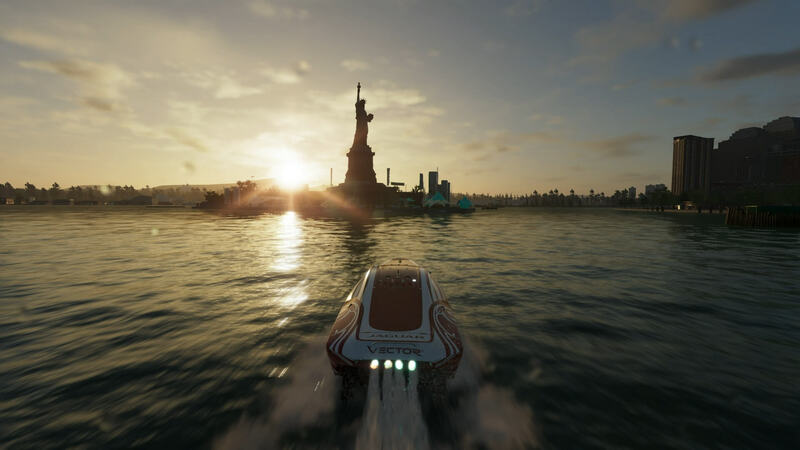 However, it isn’t long until it all goes to the extreme as Brooklyn Bridge folds down into the sea as the city behind you lifts up, literally, before you’re switched into one of The Crew 2’s other vehicle classes – boats. You’ll be riding a powerboat on the coast of Manhattan as you see the city return to its original form after its slightly unusual transformation. It’s something I didn’t expect, but it showcases the overall wackiness of stunt racing in The Crew 2. 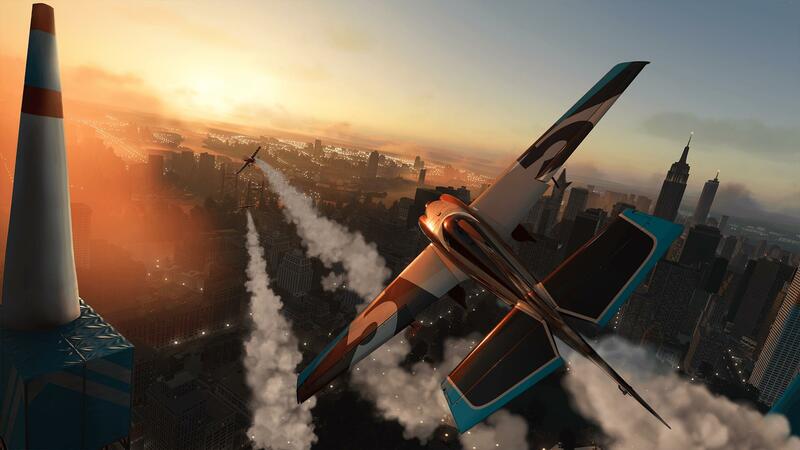 It’s no surprise that The Crew 2 would take the opportunity to introduce you into each of its main ways to play in its introductory segment, so what better time is there to take flight in some of the game’s new stunt-made aircraft? After another transformation ahead of you, the game will soon see you flying through the city skyscrapers of Manhattan and the scenic heart of Central Park as you hit the checkpoints placed ahead of you. Whilst you only have a few minutes in each vehicle in this introductory showcase, it won't be long until you'll be back behind the wheel and competing in new events as you rise from the ranks of a rookie to those of a professional athlete. As a rookie in The Crew 2, this is your chance to shine as you sample everything on offer in MotorNation. Whether it’s on the ground in street cars or off-road motorbikes, in the sea racing the fastest powerboats, or way up in the skies freestyling in the stunt planes of your dreams, the game offers you a near limitless selection of things to do – almost like a breakfast buffet. Across the country, you’ll be introduced to four different motorsport families – Street Racers, Pro Racers, Off-Road Experts, and Freestylers. Each of them has their own culture and set of disciplines, as well as their own unique HQ where you buy, collect and customize vehicles. The United States of America mapped out in The Crew 2 with each of the four HQs marked. 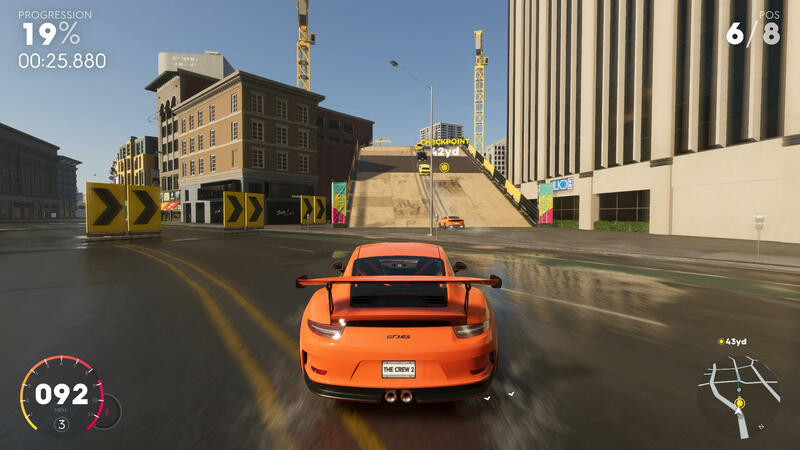 It’s up to you which to do first, but I opted for the Street Racers in Downtown Los Angeles – which sees you back in the 2016 Porsche 911 GT3 RS as a loaner car in an introductory street race. Finish it and you’ll be welcomed to the family, where your first ride will be on the house. 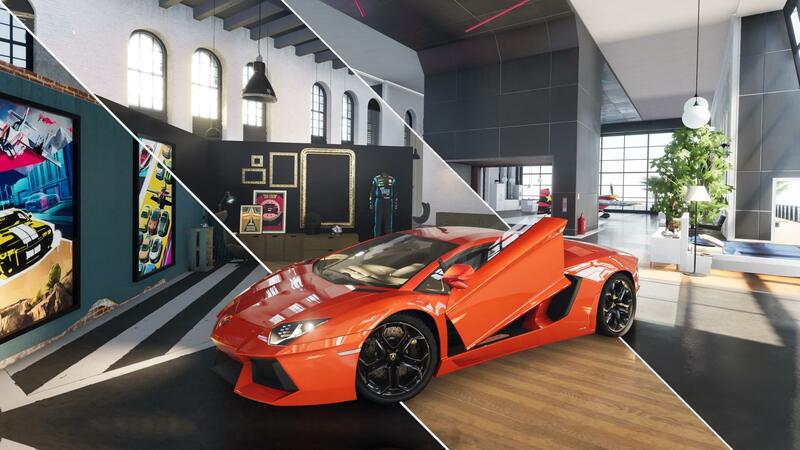 As mentioned above, each of the different motorsport divisions in The Crew 2 have their own HQ, and here, you’ll be able to walk around, engage with other players, and get up close and personal with the cars of your dreams. You’ll have a choice of three starter cars, and these include the 2016 Mazda MX-5, the 2015 Ford Mustang GT Fastback, and finally, the 2017 Audi TT RS Coupé. Naturally, I had to choose the Mustang for three simple reasons. First of all, the MX-5 will most likely be the fan-favourite of the trio. Secondly, if I’m driving an Audi, I want it to be an R8 – not a TT RS Coupé. Finally, as a huge Ford fan, the Mustang GT was undeniably the standout choice, and I could customize it to look and perform however I desire. 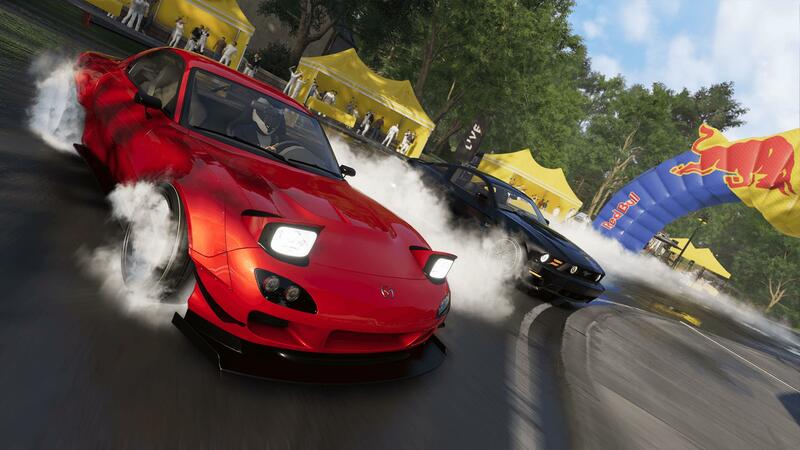 HQs are where you can find and buy cars, upgrade your ride, and hang out with fellow racers. Those of you who know me well will also be aware of my love for the 2017 Ford GT, so don’t worry, it’s indeed featured in The Crew 2, and I gave it a test drive later in my demo session – and yes, it felt and sounded absolutely incredible. Those engine crackles and pops were just heavenly. The team at Ivory Tower have made welcomed improvements to both audio quality and engine sounds across the board, and this is something that’s immediately noticeable as you start playing. It’s also a good job the radio wasn’t on. Whilst I usually always play racing games with some form of in-game music playing in the background – it’s a personal preference for me, it remained off in our demo for the purpose of video capture. 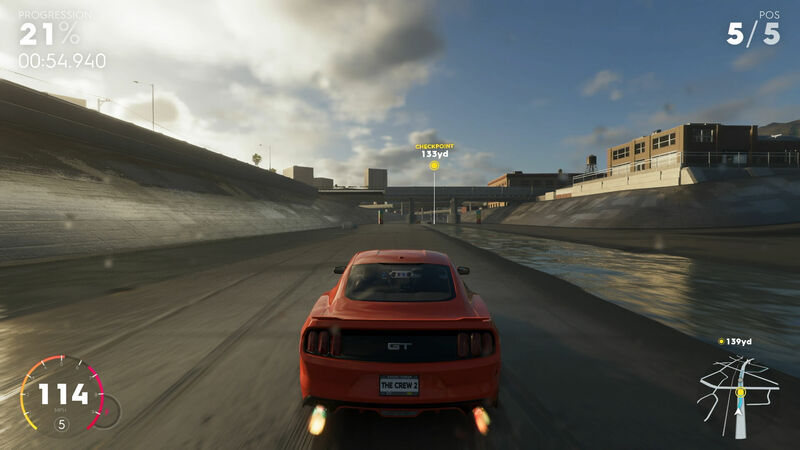 With the car chosen, additional street races popped up across the map, including new events in Los Angeles and Las Vegas. These were a great opportunity to get to grips with my Mustang before trying out the other motorsport classes. From the backroads of Los Angeles to the City of Angel's unique eastern river system, these events take you across everything each location in The Crew 2’s world has to offer. Some of these races even included multiple-routes and shortcuts, allowing you to outdo AI drivers wherever possible. Street Races take you into the suburbs and through the least obvious paths in cities. Upon completing events, you’ll earn in-game Bucks – the game’s official currency which can be spent on new vehicles and upgrade parts, as well as liveries and new clothes for your avatar. You’ll also earn more followers and loot, which is spawned on the open road. Instead of earning a new part every time you finish an event, as done in The Crew, this loot will instead be your reward – and it comes with its own upgrade parts, such as better engine components and improved tires. It’s almost a supplement to loot boxes, but instead of buying them with cash, you can only earn this loot in-game. It’s a surprising mechanic that works well, and ensures your vehicle always has the necessary upgrades ready for race events. After a few races, I was eager to unleash my inner wannabe freestyler and test out the stunt planes by the mountainous Pikes Peak countryside region near Colorado Springs. These planes are undeniably fun and exciting to fly, but The Crew 2 ensures you’re always on the edge of your ability by making you perform exhilarating stunts, such as rolls, air-drifts, loops, and low altitude flying. These stunts would be barf-worthy to attempt in person, but The Crew 2 does an excellent job of recreating the adrenaline-pumping rush and nauseating feel of these stunts – all without the puking involved, thankfully. Flying in The Crew 2 is one of my personal favourite ways to explore America. It's just stunning. Like before, you’ll get to your first aerobatics plane for free – the Zivko Edge 540 V3. This lightweight one-seater aircraft is nimble to fly but ready to pull off the stunts you need it to. The great thing about flying is that it makes it easy to increase your following by raking up insane skill combos full of air-drifts, rolls and loops whilst in the air. Flying under bridges is another impressive skill to pull off, and these will attract even more fans. You’ll find plenty of aerobatic trails scattered across the map as well – and these are some of my personal favourite events in the game. 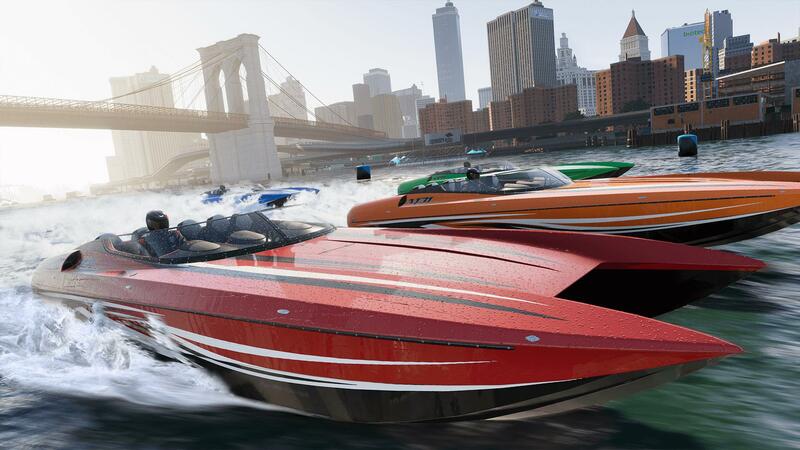 We’ve covered cars and planes, so let’s spend some time discussing the last main vehicle division in The Crew 2 – and these are the powerboats. It’s stunning to race boats alongside the coastlines of cities and country roads, but it’s even better when there’s some iconic landmarks in view – such as the Statue of Liberty when powerboating through New York City. Boats aren’t usually my vehicle-of-choice when navigating an open-world, but with tons of coastline, rivers, and streams to cruise along in The Crew 2, on top of actual powerboating race events, it makes them well-worth checking out. Whilst boating might not sound like the most exciting form of racing, it's still a neat addition. Plus, you’ll also earn a free powerboat too with the Proto Offshore MK1, which is unlocked once you complete the Pro Racing Trial, so there’s no excuses. Powerboats can be found at The Pit, which is the home of the pro racing community. This HQ offers some of the most exciting and professional race disciplines in The Crew 2, including the aforementioned Powerboats, as well as GT3 Touring Cars, Air Races in planes, and of course, Alpha GP in the most extreme racing vehicles, featuring the official F1 race car from Red Bull. Different levels of popularity are required to unlock these disciplines, so the more followers you earn, the more events you’ll be able to compete in. Much of The Crew 2’s progression system is reliant on how many followers you have, but it’s something you rarely have to worry about as the game handles it all for you. By participating in race events and pulling off cool stunts, you’ll unlock all the followers you need to progress whilst raking in unmissable rewards in the process. It’s not only The Pit that has the best motorsport disciplines though, as the Street Race, Drift, Drag Race, and Hypercar disciplines are exclusive to The Spot HQ in Los Angeles, whilst the Freestyle HQ is home to the Aerobatics, Jet Sprint, and Monster Truck divisions. Each HQ has different motorsport disciplines that you'll need to unlock by increasing your fame. Then finally, the Off-Road HQ sees you taking on off-road events such as Rally Raid, Rallycross, and Motocross. I haven’t touched upon the off-roading aspects of The Crew 2 yet, but they’re very much present and excellent. This HQ will see you taking on an Off-Road Trial like the others to get you to grips with these off-track events, where you’ll be taking the beastly and well-equipped Ford Raptor into the canyons by the Monument Valley in Arizona – blasting through checkpoints, driving up huge ramps, and taking massive jumps across the landscape. 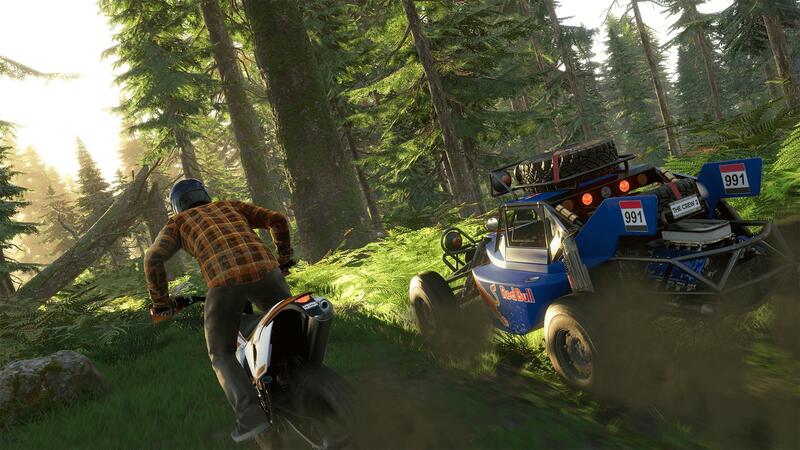 I’m not typically a fan of off-roading or dirt bike events in racing games, however I must admit, The Crew 2’s implementation was quite enjoyable and something I found myself wanting to come back to more than I anticipated beforehand, and this is mostly due to the improved handling model. Your free introductory reward for this one will be the 2017 Proto Buggy – ready and equipped for the Rally Raid events in The Crew 2. As you compete in additional events, you'll notice that instead of a loading screen, they begin seamlessly as you drive to the starting position and wait for the countdown timer to conclude. Likewise, there's no loading screen after you finish an event either. It's seamless as you disband from the AI and the game carrys pn in freeroam. 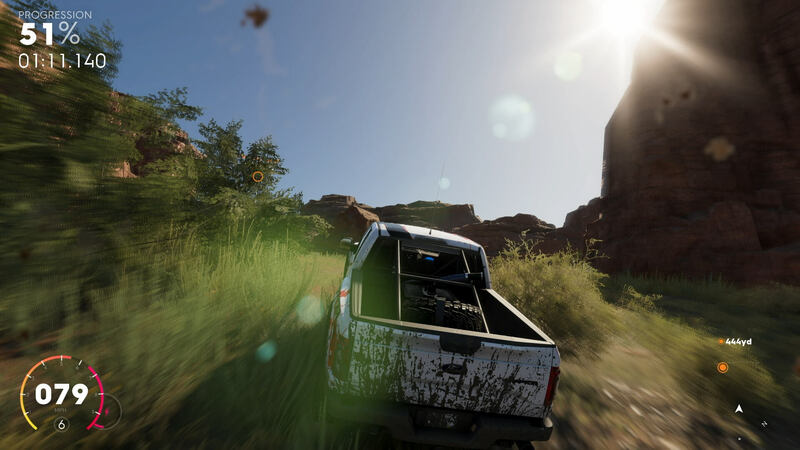 The off-road trial led to me really enjoying the off-roading experience in The Crew 2. Overall, the MotorNation campaign mode in The Crew 2 is far stripped-back in terms of storyline in comparison to its predecessor, which arguably went overboard. However, we’re instead given something that prioritizes gameplay with both the open-world and the vehicles themselves – which are undeniably the star of the show in Ubisoft’s latest open-world racing game. You may not be attempting to hunt down your arch enemy by competing in various street racing gangs this time of round, however The Crew 2’s focus on motorsports and exploring its vast open-world is ambitious, unique, and something I can see myself coming back to time and time again. The Crew 2 expresses freedom in motorsports like no other racing game has before it. 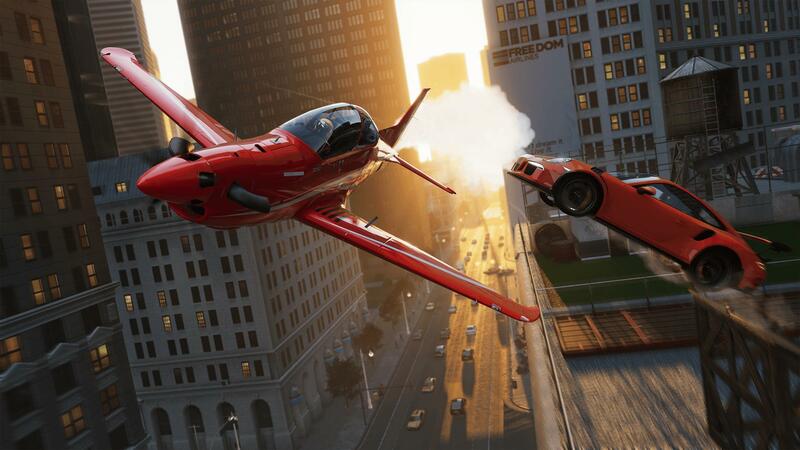 Whether you want to race buggies off-road or planes through skyscrapers, there’s no other game that allows you to do this with the officially-licensed vehicles as found in The Crew 2. However, for all of this to work, one aspect the game badly needed to improve was its handling and overall driving physics, and I’m happy to report there’s been some radical changes in these departments. Cars don’t feel as floaty anymore and have a lot more precision to them than The Crew. It’s no Forza Horizon handling model, which is extremely realistic due to its incarnation from the Forza Motorsport franchise, but what The Crew 2 delivers is both accessible and easy to adapt to. The Crew 2 isn't a simulation racer. It's pure arcade fun that's accessible to everyone. I often struggle with the handling models found in arcade racing games, especially when it comes to racing off-road, but The Crew 2 is easy enough to gets to grips with in no time – even for the most novice of players. This also applies to the all-new boats and planes found in The Crew 2. My favourite handling model out of all vehicles is surprisingly for the planes – they feel as precise and as realistic as I would come to expect from a game of this calibre. Easy to fly, but tricky to master. The Crew 2 does a great job of getting you to grips with flying these planes and pulling off stunts in its introductory events, too. Driving a powerboat towards the State of Liberty with a sunrise in the background is glorious. So, if I’m driving a 2013 LaFerrari down the streets of Miami, I can instantly switch into my favourite aircraft with the touch of a button – flying through the city before approaching the sea, switching again to a powerboat as it falls from the sky and down into the ocean, blasting through the waves. There’s no loading screens, no waiting – it’s all instant and seamless, and this headlining feature of The Crew 2 is undeniably its biggest selling point and the reason you’ll want to keep playing it with your friends online once it launches in June 2018. Similarly, if you’re bored and desire a new vehicle instantly, you can just pause the game, navigate to the vehicle selection screen and choose the manufacturer you wish to purchase from. This also enables a lot of challenge opportunities that aren’t possible in other racing games. Want to recreate the 2017 Ford GT race to the Niagara Falls from The Grand Tour Season 2? With one person in the iconic supercar and the other in the plane of their choice, it’s possible. 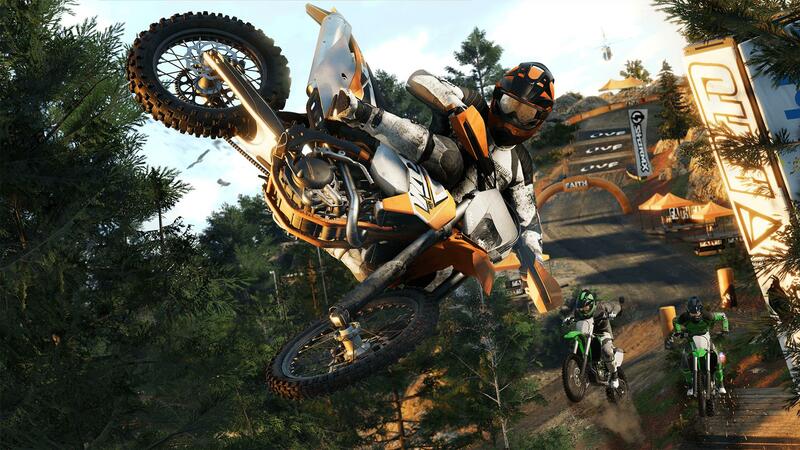 Maybe add another player in a boat, and perhaps someone in a stunt bike who’s required to stick off-road? These are the types of scenarios The Crew 2 can result in with its delivered promise of unlimited freedom. America is your playground to explore, and The Crew 2 gives you all the tools you need to own it. Cockpit view is as detailed as you'd come to expect from a modern racer, and look, there's loot! In addition, all vehicles in The Crew 2 have detailed cockpits and interiors, which especially look great when driving supercars and flying planes. Boats – not so much, but it depends on the model. There’s also a variety of different camera angles in the game you can choose from when playing, and each of them have their own advantages. Using the cockpit camera in a plane can often feel nauseating as it shakes and rattles whilst you’re moving in the air, adding to the overall realism, depth and exhilaration of the experience. It can also be stunning as you look around at not only the land or sea beneath you, but also everything that surrounds you. 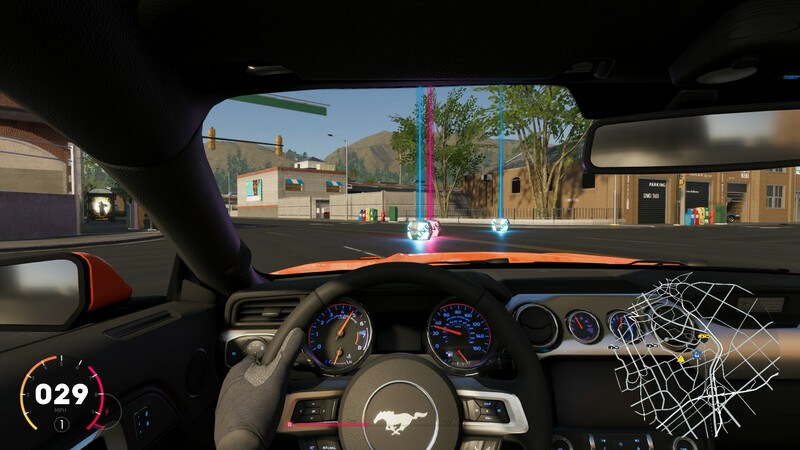 Driving fast cars down packed streets of traffic whilst in cockpit can also feel exhilarating, whilst the third-person view for boats allows you to appreciate the addition of these vehicles, as well as the landmarks and coastal scenery that surrounds you. Overall, the improvements made to cockpit view across all vehicles shows another welcomed refinement over The Crew and offers players more choice in their driving and racing experience. Here's how my Ford Mustang looked after I customized it with new body parts and a livery. Customization is also another aspect to freedom, and like its predecessor, The Crew 2 does a good job of allowing you to upgrade your ride and transforming it into the car of your dreams. From visual customization to performance upgrades and liveries, there’s plenty of ways you can truly make your vehicle your own. 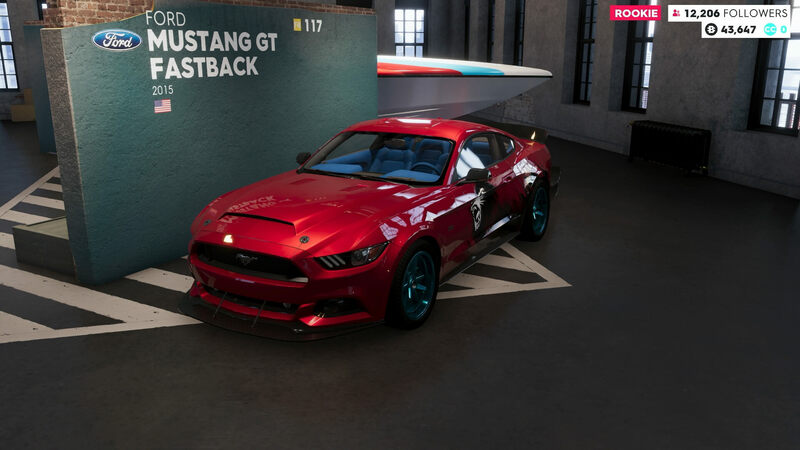 The starter car I selected at the beginning of The Crew 2, the 2015 Ford Mustang GT Fastback, was the car I chose to customize – bringing it to life and ensuring it could stand out from the crowd in race events. Upgrading cars in The Crew 2 is an easy process. The higher the number, the better the part. It was then time for the visual customization, with my choice of upgrades including a sleek new hood, a racing-inspired front and rear-bumper, dope blue rims, carbon-fibre side-skirts and mirrors, a fitted rear-wing, and a blue-themed carbon-fibre interior. I also downloaded a livery made by the folks at Ivory Tower, featuring a black roaring lion. Players will also be able to make their own liveries using the Sticker Editor and download those from the community as well. Lastly, I added a wine-reddish colour to the car to make the livery stand out even further. Combined with the new body parts, this resulted in a more stylish and unique design – and my Mustang was ready to hit the streets once more. Car customization is handled at your own in-game home, where you can find your vehicles, statistics, and even personalize your character. When entering the home for the first time, you’ll be guided by The Crew 2’s slightly-aggravating voiceover, but once he’s done talking, you can explore it all for yourself. It’s a proper apartment, and you can totally walk around it. There’s kitchen facilities, an area to customize your avatar, and of course, plenty of your room for your current favourite vehicles. You’ll also find all the ‘narrative rewards’ you’ve unlocked so far, which come in the form of in-game cinematics. 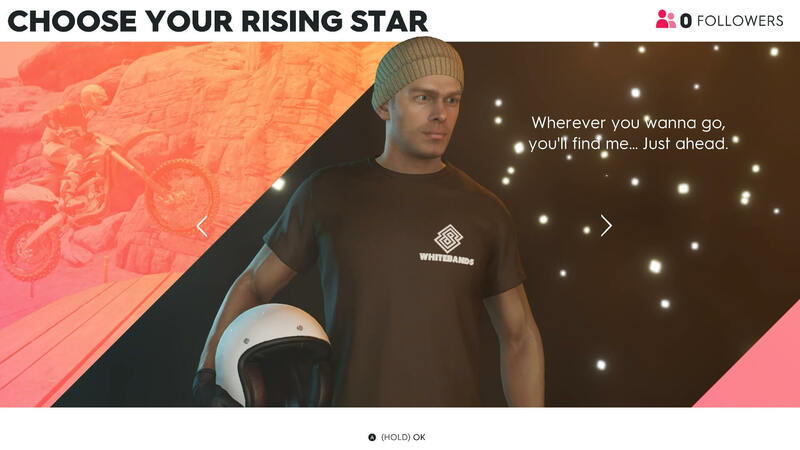 Customize your Avatar in The Crew 2 with clothes and motorsport-inspired racing suits. Personalizing your own driver in The Crew 2 is neat way of expressing the type of motorsport legend wannabe you are. You can customize your avatar’s clothing from t-shirts, hoodies, and coats to helmets, pants, gloves, and shoes. 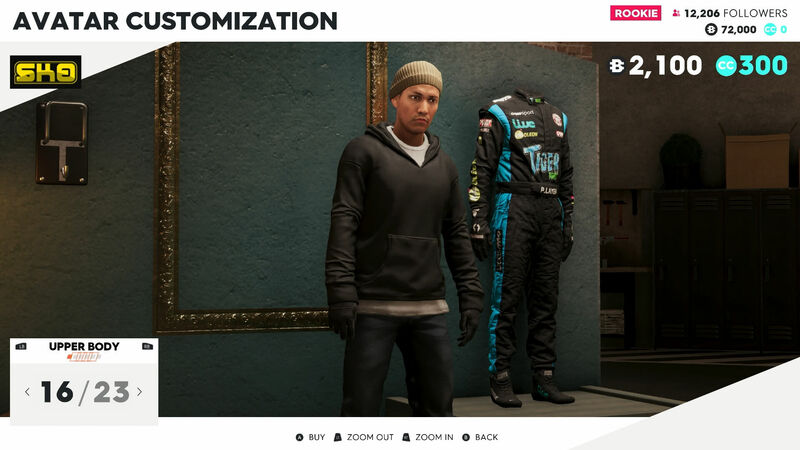 There’s also motorsport-inspired racing suits to choose from, but like the visual customization options for vehicles, all clothes available in The Crew 2 are purchased using Bucks, the in-game currency earned from race events. Crew Credits are also back, and these are acquired via real-world currency in the form of microtransactions, and can be spent on vehicles, visual upgrades, liveries and paintjobs. The Crew 2’s most appealing aspect has to be its expansive map, encompassing the entirety of the United States of America. From Seattle and Los Angeles to San Francisco and New York, The Crew 2 has it all covered with a realistic, and undeniably graphically-stunning reincarnation of America. It feels alive and varied, and there’s so many towns, cities and landmarks to explore. What makes it truly appealing is The Crew 2’s inclusion of cars, boats and planes, allowing you to discover and own the country as you please. Whether it’s on or off-road, in the sky or in the ocean. America is all for the taking in The Crew 2. Explore, own and dominate it however you want. To make a map enjoyable and addictive, it also needs to have things to do. On top of the iconic locations and varied terrain available to discover and explore, The Crew 2 also has various stunts marked across the map. These also appeared in its predecessor, but this time of round, they aren’t as plentiful or in your face – and they certainly don’t feel forced upon the player either. It’s another area of The Crew 2 which has received welcomed refinement, and it’s for the better because of it. Now players can easily access these challenges when they desire, and speaking of challenges, there’s also now a variety of ‘Live Reward’ locations to be discovered on the map. I found one when powering a boat through a small river after a race event, and these track record attempts, such as your speed, and then uploads it onto the game servers to compare your best efforts with those of your friends and the wider community. Some will require you to drift or jump over obstacles, whilst others will ask you to beat certain times and hit various speed targets. In turn, these will reward you with new followers and increase your overall popularity. Various race events in The Crew 2 will also add their own stunts and twists to the mix. When The Crew launched in 2014, it’s reincarnation of the United States was undeniably impressive. The map was huge and full of driving roads and off-road trails, but visually, it didn’t compete with other racing titles that launched around the same time. The visuals received a significant upgrade with the release of the Wild Run expansion in 2015, but in 2018, The Crew 2 takes things to a whole other level. It’s crisp, clear, and beautiful. The world feels vivid, dynamic and alive. 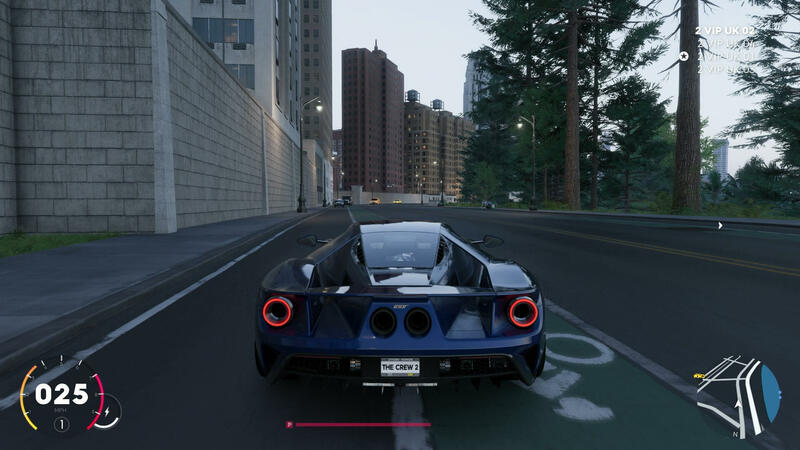 Texture quality meet the standards you’d expect from a game in 2018, and after having spent about three hours playing the Xbox One X Enhanced version of The Crew 2 in native 4K resolution, I was thoroughly impressed. Like Assassin’s Creed Origins and Far Cry 5, The Crew 2 is yet another masterclass visual showpiece for Ubisoft. Despite the version of the game we played being incomplete and work-in-progress, I was surprised by how polished it played and overall, how sleek it looked and felt. Each environment in the open-world is detailed and alive using high-quality assets. Be it a city centre with towering skyscrapers or the middle of a forest filled with lush vegetation and foliage, foggy marshlands, on a racetrack, atop a snow-peak mountain, or even in the middle of vast canyons. Whether you’re driving, boating or flying, The Crew 2 looks impressive thanks to its high draw distance and vast levels of detail, as well as staggeringly-beautiful skybox. One of my most fond moments was flying through a well-lit Times Square in a stunt plane at night time – at mid-height so I could go through the skyscrapers and appreciate the overall depth, beauty and wonder of New York City. Flying through the city at night time is something so incredible, it's awe-inspiringly beautiful. The Crew 2 is one of the new unmissable 4K gaming experiences on Xbox One X, and whilst I didn’t get to try out the game on other platforms, one can imagine those versions to be as optimized and pristine for the hardware given Ivory Tower’s work on this version of the game. 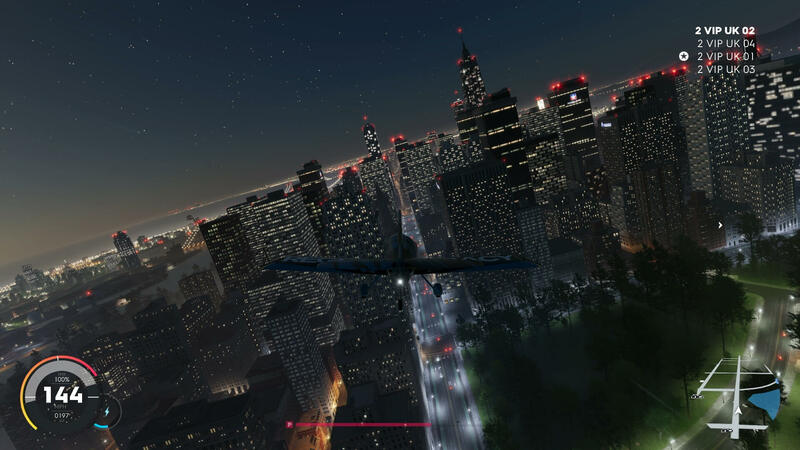 Unfortunately, it doesn’t look like The Crew 2 will have HDR support, which is a shame given how well it would look with the overall vibrancy and colours of the map. It still holds up remarkably well though, and I must admire Ubisoft’s decision to reuse the United States of America for their sequel. 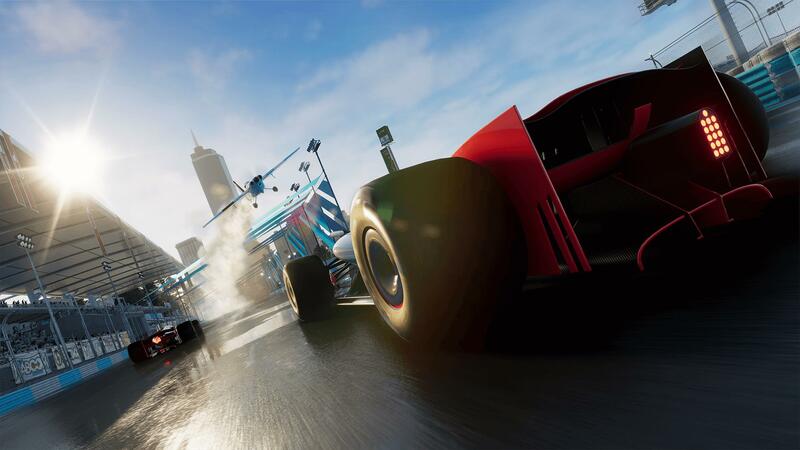 It allowed the team to flesh out each of the different locations in the game and enhance their overall quality and uniqueness whilst delivering new features with ambitious new ways to experience a racing game. After beating multiple events in the MotorNation campaign mode, getting to grips with the car handling and map environments, and of course, customizing our favourite street-ready rides, it was finally time for a new challenge and to discover another aspect of The Crew 2 – the online multiplayer experience. Those of us at the event were asked if we’d like to team up to tackle some online events together in cooperative play. This included my fellow FullThrottle co-owner Tom Matthews, as well as YouTuber StraightUpHippo and Rich Stone of TrueAchievements. The Crew 2's online integration is one of its strongest points. It's seamless and it works well. The transition to online play from solo was quick, easy and seamless. No hassle, no loading screens. As the host of the lobby, StraightUpHippo was able to select the events we wanted to play, however, that didn’t limit us in terms of what we could do. We didn’t have to accept the prompt to join his chosen events, as we could simply play by ourselves and continue our own MotorNation campaign progress, purchase and customize vehicles, or just chill out and explore the open world. The Crew 2 is all about choice and freedom, and nothing shows that more than its online integration. Initially, we participated in a variety of events, including Motorsport-inspired races in GT3 cars on the track, street races in our highly-customized rides, and JDM-inspired drifting in our Mazda RX-7s. Let’s talk about drifting a bit more, since it’s one of the Motorsport disciplines within the Street Racing family. Drifting is all about going sideways, and this event required us to achieve enough points around a construction shipyard within a set time. At first, it felt tricky and took a little while to get to grips with the overall handling mechanics when going sideways, but then it all started to come together lovely as I eased with the throttle control and focused on getting those drifts as smooth as possible. The introductory drift event in The Crew 2 is fun alone. It's even better with friends. 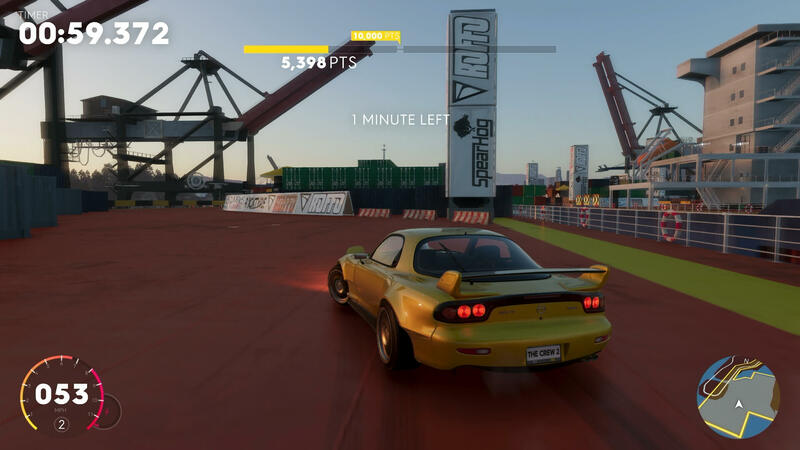 Whilst it’s easy to drift in The Crew 2, it’s difficult to master, and for this event, it was all about which of us could earn the most points. The Mazda RX-7 was perfect for the job, and it made sliding around the construction site quite enjoyable – and I’m no massive drifter at all, but I could still do it. I was quite impressed by how we could all participate in this drift event online together and watch as our live scores updated immediately on the screen. It’s a nice touch, and The Crew 2 is full of events to enjoy in online play. In fact, all the solo events and motorsport disciples can be enjoyed with your friends online – regardless of whether it’s on-road or off-road in land vehicles such as supercars or motorbikes, in the sea on powerboats or jet-skis, or in the air when flying stunt planes. If motocross is more your thing, The Crew 2 also offers plenty of events in this category as well. After a few more street race events, we begun venturing back into our own business. Tom decided he wanted to do a road-trip across the United States in the 2017 Ford GT, whilst I wanted to test out various cars out on a track. The others meanwhile were progressing with their campaign and exploring the game’s vast open-world. The impressive thing here is that this was all interconnected. We were all still in the one session, all doing our own thing – but we could still meetup whenever and wherever we wanted by either fast-travelling or navigating to the same location. Once there, we could perhaps arrange an impromptu race, pose for some photos, or even record a cinematic film together. This is the beauty of The Crew 2. It’s all interconnected and seamless, all unified in one world. Flawless. Before the end of our demo, the developers at Ivory Tower asked if we’d like a little gift. A gift in the form of $1 million in-game Bucks to spend on whatever we desired. Be it fast cars, expensive planes or exotic powerboats, this was our opportunity to check out whatever we wanted to in The Crew 2 and acquire the vehicles of our dreams. This is when Tom and myself managed to obtain our very own Ford GTs, and it’s also when I got to test drive those track-ready GT3 race cars I discussed at the beginning of the article. The 2017 Ford GT. It's my favourite car, and the engine pops from it in The Crew 2 are heavenly. Shortly thereafter, the developers gave us even more money, allowing myself to check out that Formula 1 race car from Red Bull, as well as even more exotic hypercars such as the lavish Koenigsegg Regera. It’s worth noting though that some cars can only be purchased in the game once you beat the current champion of their respective motorsport division or hit a specific Icon ranking, so keep that in mind as you consider which cars you’ll spend your hard-earned cash on. The Crew 2 is undeniably a massive step-up over its predecessor. With a more refined map and gameplay experience, a mammoth sized car roster with the addition of boats and planes, as well as a seamless online experience, it’s a vast upgrade over Ivory Tower’s previous game. When you consider how polished and refined The Crew 2 feels already, one can only imagine how it’ll be once the game hits Xbox One, PlayStation 4, and PC on June 29th, 2018. Overall, I can see myself pouring hours and hours of my time into The Crew 2 when it launches this Summer. 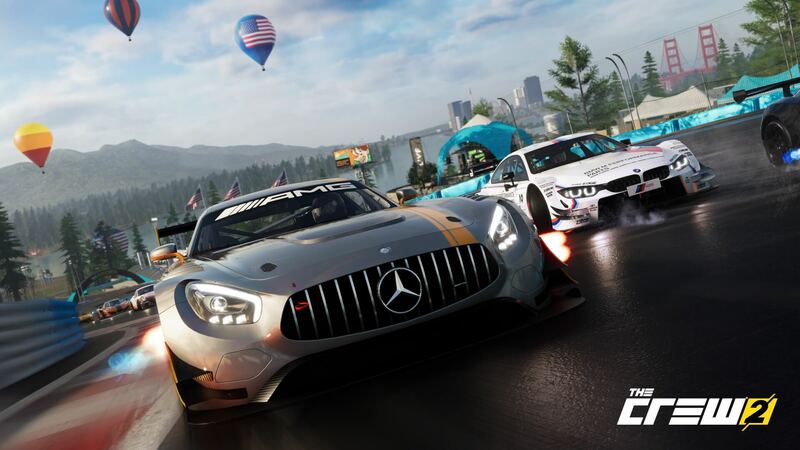 It’s typically a quiet season of the year when it comes down to new releases, but Ubisoft’s latest racing game is shaping up be one that’s unmissable. Whether you’re cruising across highways, the countryside and canyons in supercars like the Ford GT and Acura NSX, flying through the city skylines of Los Angeles and New York City, sailing down the coast with stunning vistas and landmarks around you, or beating your friends in challenges – The Crew 2 has it all. Given the issues surrounding The Crew when it first released, and problems which persist in the game more than three years after its release, I was quite sceptical going into The Crew 2. However, since playing the game for about three hours around two months before its global release, it’s clear that Ubisoft and Ivory Tower are onto something here and expectations have been set high. It’s far more polished than the original game – at least on Xbox One X, and it looks spectacular, handles well, and plays great. The Crew might not have been the racing game we wanted it to be, but The Crew 2 is certainly heading in the right direction. With all its unique innovations, ambitious ideas and seamless gameplay experiences, perhaps it’ll be one of the must have racing titles of the year. We’ll see come June 29th.